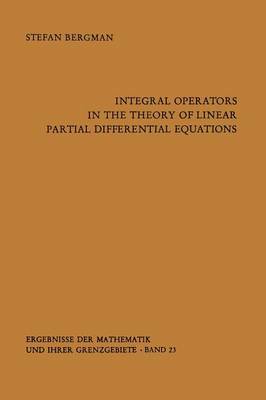 The present book deals with the construction of solutions of linear partial differential equations by means of integral operators which transform analytic functions of a complex variable into such solutions. The theory of analytic functions has achieved a high degree of deve- lopment and simplicity, and the operator method permits us to exploit this theory in the study of differential equations. Although the study of existence and uniqueness of solutions has been highly developed, much less attention has been paid to the investigation of function theo- retical properties and to the explicit construction of regular and singular solutions using a unified general procedure. This book attempts to fill in the gap in this direction. Integral operators of various types have been used for a long time in the mathematical literature. In this connection one needs only to mention Euler and Laplace. The author has not attempted to give a complete account of all known operators, but rather has aimed at developing a unified approach. For this purpose he uses special operators which preserve various function theoretical properties of analytic functions, such as domains of regularity, validity of series development, connection between the coefficients of these developments and location and character of singularities, etc. However, all efforts were made to give a complete bibliography to help the reader to find more detailed information.